A Mom Friend at my elementary school sent me this article and asked me to comment on it for my blog. She speaks Chinese and French and wants to start her children on both languages as well. I believe deeply that this generation of children must learn two foreign languages if they are to play a part in this new global economy and that, sadly, the United States, is and will no longer be at the epicenter of the world. I have heard that at our public high school, the college counselors are telling the high school students that top colleges want to see fluency in TWO foreign languages. Then at work, the other day, I had a long conversation with a colleague at work whose husband is Finnish; he speaks 3 languages AND English. We were saying that everywhere else in the world, it’s NORMAL to learn two other languages. And I was at another dinner at Bentley College for folks who teach entrepreneurship at business schools, and these two professors from the Middle East who work in the U.K. spoke an amazing 7-9 languages. And I made them explain exactly how and when they learned them. (Secret: they start early and keep adding). But I am also remembering that when I was in college in the 1980’s, there was a wave of urgency for everyone to learn Russian. But then the Soviet Union disintegrated and no one cared about the Russian language anymore. Does anyone remember that? And then there was this wave when everyone wanted to either teach English in Japan or learn Japanese about a decade later when I was in graduate school. I myself started taking Japanese lessons after a short stint in Japan. But, I do believe that as far as I can see, it’s probably prudent to learn Chinese. It is never a disadvantage in life or in one’s career to speak another language. AND it’s a tough language, so if you really want to be able to speak it with some proficiency, you better start early in order toto nail the pronunciation (tonal language; 4 tones so each tone is a different word even though the letter sound is the same). My Chinese tutor tells me, as I do not speak Mandarin Chinese, that while there is a lot of vocabulary, there is very little grammar. Once you have the pronounciation conquered and learn an immense amount of vocabulary (plus characters; one for each word! ), it’s all downhill! I also have my kids learning Spanish. It’s much easier to pronounce the words though we are struggling to roll our “r’s.” It’s actually the opposite of Chinese in my mind; there isn’t as many vocabulary words as English, but the grammar, particularly those pesky irregular verbs, is enough to make you crazy! As I see it, if you can speak English, Chinese and Spanish, you are covering a large chunk of the world. Just add a little Farsi, and you are good to go! If you are inspired to start introducing foreign languages to your children, I have a blog entry on the products I use. The Yu Ying charter school has recruited five native Chinese speakers living in the United States to teach their classes. 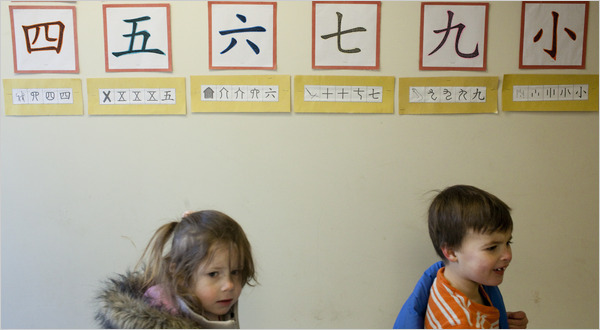 WASHINGTON — Thousands of public schools stopped teaching foreign languages in the last decade, according to a government-financed survey — dismal news for a nation that needs more linguists to conduct its global business and diplomacy. But another contrary trend has educators and policy makers abuzz: a rush by schools in all parts of America to offer instruction in Chinese. Some schools are paying for Chinese classes on their own, but hundreds are getting some help. The Chinese government is sending teachers from China to schools all over the world — and paying part of their salaries. At a time of tight budgets, many American schools are finding that offer too good to refuse. In Massillon, Ohio, south of Cleveland, Jackson High School started its Chinese program in the fall of 2007 with 20 students and now has 80, said Parthena Draggett, who directs Jackson’s world languages department. No one keeps an exact count, but rough calculations based on the government’s survey suggest that perhaps 1,600 American public and private schools are teaching Chinese, up from 300 or so a decade ago. And the numbers are growing exponentially. Among America’s approximately 27,500 middle and high schools offering at least one foreign language, the proportion offering Chinese rose to 4 percent, from 1 percent, from 1997 to 2008, according to the survey, which was done by the Center for Applied Linguistics, a research group in Washington, and paid for by the federal Education Department. “It’s really changing the language education landscape of this country,” said Nancy C. Rhodes, a director at the center and co-author of the survey. Other indicators point to the same trend. The number of students taking the Advanced Placement test in Chinese, introduced in 2007, has grown so fast that it is likely to pass German this year as the third most-tested A.P. language, after Spanish and French, said Trevor Packer, a vice president at the College Board. “We’ve all been surprised that in such a short time Chinese would grow to surpass A.P. German,” Mr. Packer said. A decade ago, most of the schools with Chinese programs were on the East and West Coasts. But in recent years, many schools have started Chinese programs in heartland states, including Ohio and Illinois in the Midwest, Texas and Georgia in the South, and Colorado and Utah in the Rocky Mountain West. “The mushrooming of interest we’re seeing now is not in the heritage communities, but in places that don’t have significant Chinese populations,” said Chris Livaccari, an associate director at the Asia Society. America has had the study of a foreign language grow before, only to see the bubble burst. Many schools began teaching Japanese in the 1980s, after Japan emerged as an economic rival. But thousands have dropped the language, the survey found. Japanese is not the only language that has declined. Thousands of schools that offered French, German or Russian have stopped teaching those languages, too, the survey found. To prepare the survey, the Center for Applied Linguistics sent a questionnaire to 5,000 American schools, and followed up with phone calls to 3,200 schools, getting a 76 percent response rate. The results, released last year, confirmed that Spanish was taught almost universally. The survey found that 88 percent of elementary schools and 93 percent of middle and high schools with language programs offered Spanish in 2008. The overall decline in language instruction was mostly due to its abrupt decline in public elementary and middle schools; the number of private schools and public high schools offering at least one language remained stable from 1997 to 2008. The survey said that a third of schools reported that the federal No Child Left Behind law, which since 2001 has required public schools to test students in math and English, had drawn resources from foreign languages. Experts said several factors were fueling the surge in Chinese. Parents, students and educators recognize China’s emergence as an important country and believe that fluency in its language can open opportunities. Also stoking the interest has been a joint program by the College Board and Hanban, a language council affiliated with the Chinese Education Ministry, that since 2006 has sent hundreds of American school superintendents and other educators to visit schools in China, with travel costs subsidized by Hanban. Many have started Chinese programs upon their return. Since 2006, Hanban and the College Board have also sent more than 325 volunteer Chinese “guest teachers” to work in American schools with fledgling programs and paying $13,000 to subsidize each teacher’s salary for a year. Teachers can then renew for up to three more years. The State Department has paid for a smaller program — the Teachers of Critical Languages Program — to bring Chinese teachers to schools here, with each staying for a year. In the first two years of its Chinese program, the Jackson District in Ohio said it had provided its guest teacher housing, a car and gasoline, health insurance and other support worth about $26,000. This year, the district is paying a more experienced Chinese guest teacher $49,910 in salary and other support, in addition to the $13,000 in travel expenses he receives from Hanban, bringing his compensation into rough parity with Ohio teachers. Ms. Draggett visited China recently with a Hanban-financed delegation of 400 American educators from 39 states, and she came back energized about Jackson’s Chinese program, she said. “Chinese is really taking root,” she said. Starting this fall, Jackson High will begin phasing out its German program, she said. Founders of the Yu Ying charter school in Washington, where all classes for 200 students in prekindergarten through second grade are taught in Chinese and English on alternate days, did not start with a guest teacher when it opened in the fall of 2008. “That’s great for many schools, but we want our teachers to stay,” said Mary Shaffner, the school’s executive director. Instead, Yu Ying recruited five native Chinese speakers living in the United States by advertising on the Internet. One is Wang Jue, who immigrated to the United States in 2001 and graduated from the University of Maryland. After just four months, her prekindergarten students can already say phrases like “I want lunch” and “I’m angry” in Chinese, Ms. Wang said.